There's a video game. It has fighting samurais. It's called Samurai Shodown. (I know, I know, no "w.") I liked it when I was a kid. It takes place in the late 1700s. Apparently, it's now in its sixth incarnation. 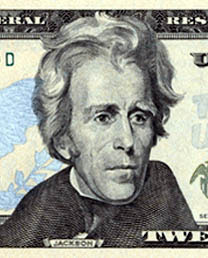 This newest version features an American character named Andrew, who is based off Mr. Twenty Dollar Bill himself, noted dead American president Andrew Jackson. He fights with a bayonet. I find this hilarious. You may be more familiar with him looking like this. And now, the version in which I take forever to get to my point. A good chunk of my elementary school pizza parlor birthday days experienced a renaissance a few months back with the arrival of Metal Slug Anthology for the Wii. Metal Slug is a hand-drawn shoot-'em-up that came from Japan but more than likely appeared in any given American pizzeria in the mid- to late-90s. It's also an absolutely brutal game that will probably wipe out all three of your little army men before you have time to blink. (In that sense, it's an ideal arcade moneymaker.) When it came to my home console, however, the seven Metal Slug games became a much more affordable proposition, and I beat them without having to spend my lifesavings in quarters. (Another plus: non-greasy joysticks.) Total surprise ending, too. When you kill the aliens, the earth is saved and you see the credits! Today, I read that SNK — the company that made Metal Slug and the Neo Geo arcade system, the ones where you could scroll through three or four different titles in a single cabinet — has announced at the Tokyo Game Show that it will also be bringing another beloved childhood series to the Wii: Samurai Shodown. As I mentioned just a few days ago, this game — which even today makes me instinctually spell "showdown" without the "w" — rocked my prepubescent brain back in the day. Whereas Metal Slug was one of those run, jump and shoot numbers, Samurai Shodown was a two-dimensional one-on-one fighter in the style of Street Fighter II or Mortal Kombat. What set Samurai Shodown apart, however, was its style: hand-painted backgrounds that look gorgeous even today, music that played like the soundtrack to some lost Akira Kurosawa epic, and combatants who spoke — spoke! — full sentences. Sure, this speech was in Japanese, even for characters who didn't come from Japan, but the overall effect was nonetheless stunning on an eleven-year-old who had been weaned in then-cutting edge 16-bit home systems. Research into the series later in life taught me an additional virtue: I found that a good handful of the characters in the game were based on actual, historical personages. Hanzo Hattori — whose name might seem familiar from Kill Bill — also appears in Samurai Shodown, as does a valiant samurai named Jubei Yagyu. 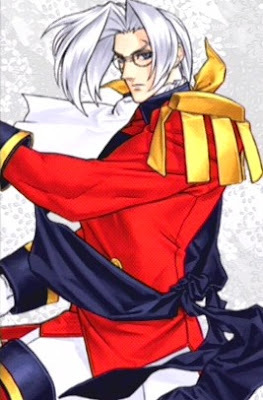 The game's villain — an effeminate, demonic priest named Amakusa Shiro Tokisada — is based on a historical Amakusa Shiro Tokisada, who was once touted by leaders of the Shimbara Uprising as being destined to Christianize Japan. (He failed, of course. You know what they say about who gets to write history books? Well, those same people apparently hold grudges and make video games.) Sure a lot of historical timelines were fudged to get these various sword-wielders to duel — blue-eyed, blond-haired ninja Galford, for example, hails from a portside metropolis San Francisco long before the city actually existed in that state — but the sense of history always appealed to me. Now in its sixth incarnation, the game now boasts an additional American: Andrew, a bayonet-toting solider modeled after Andrew Jackson. How a bunch of Japanese game designers ever chose Jackson, of all dead presidents, to take on sword-wielding samurai is beyond me, but it amuses the hell out of me that I will soon be able to play as a reasonable facsimile of Andrew Jackson the next time I return to the some video games re-imagining of late 18th-century Japan. I can only hope that the below political cartoon — which features Jackson battling a dragon representing the banking industry and which acually looks like it could have been printed on some old piece of currency — played some role in inspiring Andrew's inclusion. It's a close call, but this has to be a weirder convergence between pop culture, American history and Japanese video games than when I found out that the "Zelda" in Legend of Zelda is a reference to Zelda Fitzgerald. Like, less of this kind, yes?